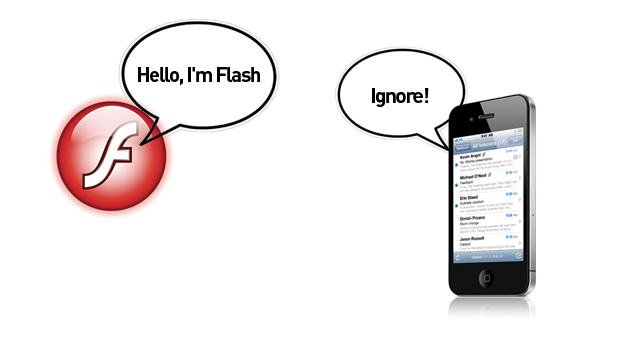 It’s not a secret that Apple mobile devices don’t read Flash or Silverlight. I always thought that Apple products are creative platforms with enhanced user experience and nice design, however right now Apple really limiting creativity for designers and developers by its inability to play flash animation. Ok, we can live without Flash banners, but how about Flash games which are so popular on Facebook or flash business applications that been around for years. At the end all we have is three choices 1: start getting rid of flash completely to support Apple devices 2: Wait for HTML5 to arrive which is promising to embed links for video, audio, flash, etc, so there no plug ins required 3: Think of Apple as an arrogant company and just ignore their inability to read the flash files. The last one will be hard to do I tell you that!